Before I start, NO PICTURES ON THIS FIRST POST ARE MY OWN - they are from the net for reference only. I`ve been collecting pictures for years - if I can reference, I will do. I am posting for inspiration and ideas. For many years I have wanted a clock wheel depthing tool. 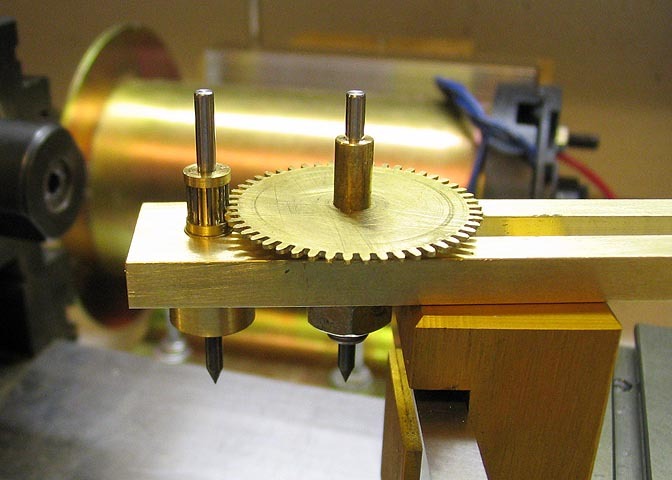 This tool allows you to correctly distance a wheel and pinion and then scribe the correct distance onto the frame. A cheap simple depthing tool can be made by plans described in several books I own, specifically by John Wilding and Colin Thorne. This is good for the majority of jobs, but at 30 years old, I`d like to keep this for a good time and would like to invest more time in to making a more traditional and more versatile tool. There are loads and loads of homebrew depthing tools on the internet. My issue is that they rarely describe the machining process to ensure they maintain parallelism between the two split runners. Also, I`m not clear how the hinge is made or designed to ensure the two parts are held firmly without wobble but lose enough to be moved. I also don`t know how the spring is being applied to force the two halves together!! Lots of food for thought! If you have any ideas or suggestions as to how to make one, I`d appreciate your input. The key is getting the runners parallel and a solid hinge between the two parts but allowing you to fine adjust the two. I believe there is a full article: MEW no 8 Dec 91 jan 92 - if anyone has a copy of this article, I`d be really grateful! I look forward to replies. Hi Chris , interesting tool, I do have some randon old MEW I will check through and see but I think they are a bit later from memory but you never know. Cheers Mick. The hinge appears to be a simple knife edge or bar in a pair of Vs. I suspect two bearing balls in small holes would suffice. It is only necessary to ensure that the spring closing force is applied between the hinge and the opening adjuster so both are forced together. 1.) The hinge is the hardest part to make, and most important part -- everything else follows. So make the hinge first, as precisely as you can, ignoring the rest of the needs. Make the hinge whatever way or shape you want. But just get that part fabricated. 2.) 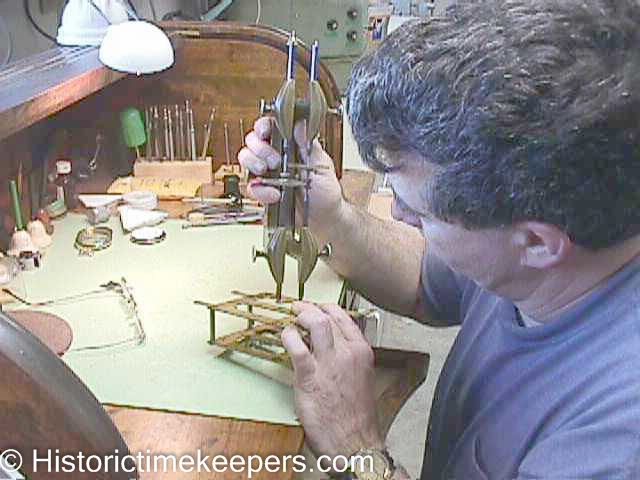 Then fasten or clamp the hinged assembly to a mill or boring table. You can now drill/bore arbor holes/bearings whatever. If you index the table without loosening the part, you will automatically make holes parallel to each other and the established hinge line. (Assuming you clamped it true to that line, in the first place, of course). ps. a boring table on the lathe might be better for this than a vertical mill -- depends on the size of the piece. Thanks for the info so far. If a bar running in v grooves is used for the hinge, I dont see how the assembly is held together, I.e force at the bottom on the bar. it'll stay together if the force is between the hinge and the adjuster i.e. it is pulling both together. That would be more Vert-Mill friendly than long bored holes. I tend to still think boring because that's how my homemade lathe came together, long before I had a vertical mill. But V-grooving everything makes a lot of sense. You can do all the main body grooves without shifting the part in the clamping setup, which makes them all parallel. Good way to do it! I made one out of several 4" brass hinges , knocked the pin from two and rivited them together then reamed for the pins and cut out the centre , stil got it somewhare . BillTodd - I really really like the ball bearing suggestion! I know I'm being thick but I'm still not clear how they would be held and forced together. Obviously some have the obvious spring on the side bar I mentioned in my first post but I can't see how the others are spring closed without this. I understand the adjuster is putting pressure on the hinge, bar, ball bearings but what is holding them from just falling apart. Bill - also, why 4 bearings in each top corner? This method would stop me needing to machine a parallel v groove for the bar hinge, I'd still need to machine, either mill a groove or bore a long parallel hole along each top side for the runners right. The length of the depthing tool will be about 170mm long... That's a long way to bore two holes!! balls are 4.5mm in 4mm holes. If the holes are drilled and reamed with the two plates clamped together the hole positions will align perfectly. All you need to do is drill them in the correct places. Perhaps using a flexure instead of a hinge would do the job. Mill grooves in the bottom of the two uprights and solder or epoxy in a strip of springy steel -- a bit of metal strapping might do the job. Mill a pair of grooves into a base plate and solder or epoxy the other side of the strips into it. You will have a fairly limited range of travel but it would probably be adequate for your needs. If you really want to be fancy, for the adjusting screws you could make a differential screw from a 4mm coarse and a 6mm fine capscrew. Machine the head off of the 4mm and remove a cm or so of threads and drill a hole of an appropriate diameter and depth into the 6mm fastener. Press fit, loctite or solder the 4 mm bit into the 6mm. Put a post drilled and tapped with a 4mm coarse thread on one arm and one with a 6mm fine thread on the other. That would give you an effective screw pitch of .05 mm per turn. At least one of your posts would have to be removable for coarse adjustment. Might be overkill. Bill that really is genius. So you'd drill all holes with the two frames pinned together. 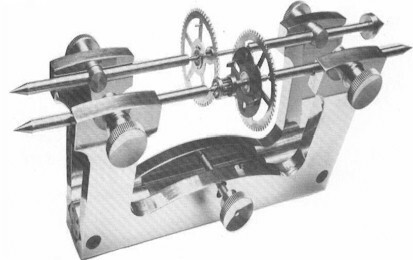 Providing the two frames were set horizontal on the mill, I'm guessing it would ensure the runners are parallel. Iff the points are sharp you can test by scribing a curve form each end , and there is one line it must be parrallel . BillTodd, have you by any chance dimensional drawings for that? It looks very much in proportion and would give me a scale to work from. The next question is brass, steel or aluminium? - brass looks the part but is pricy. I wonder now if it would be nicer if the depth adjusting screw was now placed more centrally, in the position of the old spring hole perhaps. Also, I'm just wondering if it would be better to slightly oversize the holes in the runner threaded rods. My thoughts were getting onto reaming these accurate but actually, there job is only to pull the runners against the bearings so having the hole larger would I expect be better, allowing the runner to find its true seat. Also,could the balls be soldered in position or is this likely to push them out of position slightly with the solder running below them. I would have thought that there wouldn't be a right lot for the glue to stick to. Why not. Clamp and solder from the hole side should keep any lifting to a minimum. I've attached some plans that were freely available at some point on nawcc forum. The shape and dimensions on here look good. cut longways? or are you thinking a C shaped version? I can get bar stock that is 1/4" thick by 3" wide. That means I can use cz121 (?) extruded bar rather than 1/4" brass plate which would be much more expensive! Yes, that looks a better price. I have purchased the brass needed for the depthing tool today - 1/4". Would two large bulldog clips be more suitable? Could you just explain your thoughts on bearing size for the pivot/hinge? You mentioned 4.5mm in a 4mm reamed hole. You also mentioned that slightly larger may be better for the hinge - why? And what size - 5mm, 6mm? Chris, did you get my PM? Sorry Bill, just got it. I'd some how opened it but not seen it! I'll download on my laptop today! Model Engineer 19 October 1973 - I believe it starts! Are they bulldog clip springs??? Don't know about you but looks homemade! Could be a clog mile out. Bill, I'm not going to lie. Since having this discussion I have actually got my hands on some original Malcolm Wild depthing tool castings. However, I promise you I'm so excited about the ball bearing idea that I'm going to attempt making that as my first project when my workshop is setup!! Wondering how did this progress? Don't know anything of the mater, but remembered this thread! Aprils issue of Model Engineers Workshop had plans and an artical for a dpthing tool , using a bulldog clip spring I don'd know iff it's the same , iff you can't get a copy pm me . It doesn't by any chance use bulldog clips and ball bearings as hinges does it!!! If so, I have an idea where he plans came from. No ball bearings but a hinge bar , it's 150 x 70 mm body , I have a PDF of the issue . Well its been months since I last posted and I`ve been moving forward at a snail pace. Anyway, finally its been made. It may have been 3 years ago or more, but the concept works and the project is finally finished. At the end of the video i was thinking you will have to get the measurement from the centers of the pins i was so surprised to see it doubles as a divider a very clever design... you made a smashing job of your tool. Thanks a lot for your reply. It's working just great!